It would seem that there are people who are somehow offended by some of the things my friends and I make. Yes, part of it is because we're curious as to how it'll turn out, if it's even edible, or if one of us is stupid enough to eat it as a challenge, but part of it is simply that we actually enjoy eating this stuff. Listen, I realize that the internet is a precious commodity (not to mention very serious business), and I'm sorry if you believe I'm wasting your bandwidth, but until my inevitable heart problems catch up to me, my posting will continue. Or until I'm broke. That might come sooner. 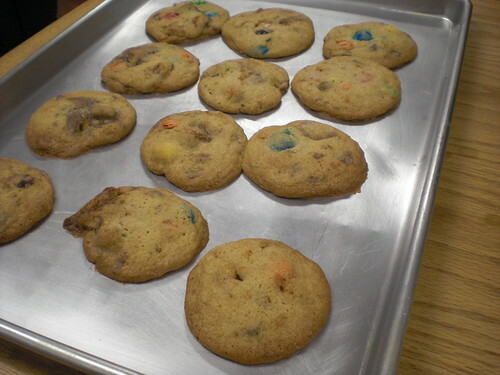 Without further adieu, I present something that we made looooong ago... assorted candy cookies. Hmm, maybe I need a better name for that. 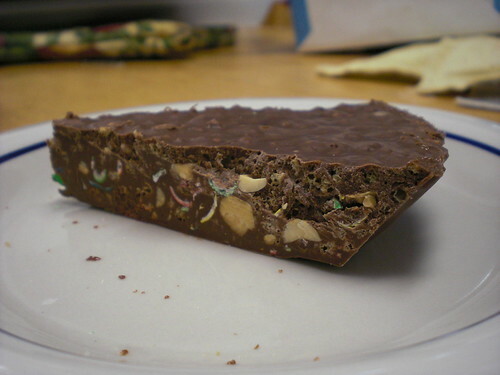 I don't actually recall the specifics of us deciding to make a batch of these, it might've been fueled by a candy surplus. Anyway, onto the specifics. First you start with a giant batch of candy. I um... somehow fall into mass quantities of candy bars and M&M's. It's just one of those things that's always in our suite, guaranteed. In fact, there's a bag of probably 20 or 25 bags/bars of candy in one of our closets right now. 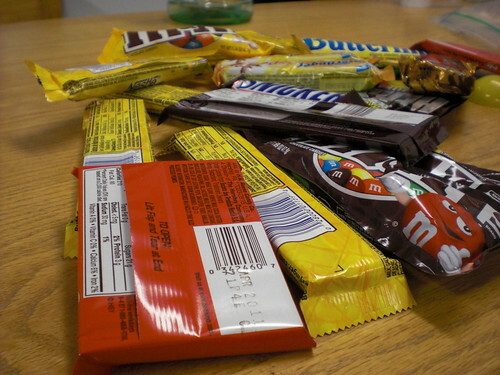 Between Twix, Butterfingers, M&M's (peanut, dark chocolate, and regular), Snickers, and all the usual suspects, we have a fairly diverse selection to choose from, but let's be honest, eating chocolate by itself gets boring at some point, and I do use food as a means to relieve stress from school. With a dough recipe lifted from 'The Girl Who Ate Everything,' a bit of everything went in to replace the chocolate chips. Broken Twix bars, some remnants of Butterfinger filling, Snickers, M&M's, Almond Joy and Mounds both, and I think some Milky Way, all of them found their way into our batter. There was a concern that the chocolate and caramel bits would burn well before the dough counterpart baked to completion, so we scaled back the temperature to 275 and let it sit in the oven to cook on latent heat. For some reason, the picture above makes them look really flat (and yes I fail at portioning/spacing), but the end result was a fairly moist, almost cake like cookie. The candy bits more or less all melted into the dough, so there wasn't any hard shell like remnants from the Butterfingers or the M&M's. All in all, it was a pretty pleasant experiment, that I would most likely repeat. Nothing overly heavy, but definitely not something I'd want to have on a nightly basis. I've been told of a mythical place near Bowery, a 2 story version of M2M. Hopefully I'll get a chance to visit it before leaving NYC. Anyhoo, back to the point of this post. I love M2M. Probably more than I love Hamdel. If it weren't so damn far across campus (yes I will sit and row for hours, but walking across campus is an ordeal for me), I probably would never go anywhere else. Let that be a testament to how much I like this little deli. In fact, despite the distance I need to walk, I've gone so much that the Filipino guy behind the counter knows my order for a cheeseburger. So clutch. Lettuce, onions, tomatoes, pickles, and ketchup on 1 side only. I do this because they really like to pile on the ketchup. Anyway, I'll do something similar to what I did for Hamdel, and I'll pick 8 sandwiches that I happen to like a bit more than the others, just as a 'suggestions' list for when you're confused by all the options. 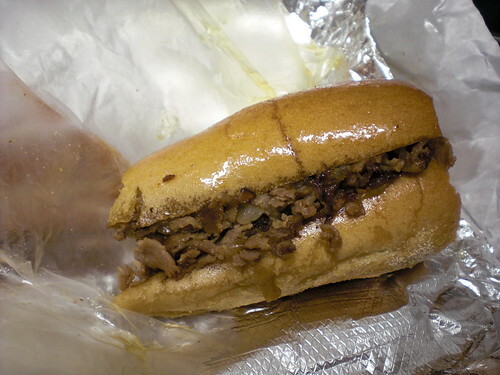 New Yorker - Pictured above, it's basically a Philly cheese steak that uses cheddar and bbq sauce instead of red/green peppers and wiz. 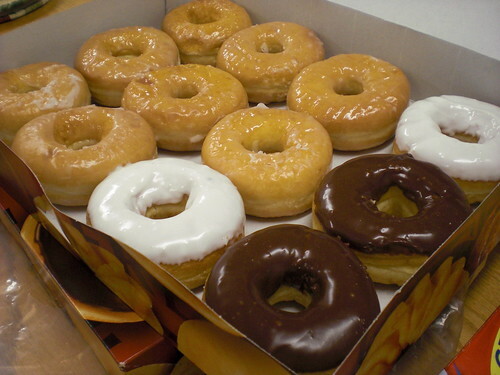 To be honest, I only took that picture because I was impressed by how oily it was. Grab some tums, but the shine on the bread doesn't do the taste justice. Spicy Grilled Chicken Wrap - Simply... grilled chicken (covered in Sriracha), mozzarella, red beans, rice, avocados, and lettuce. 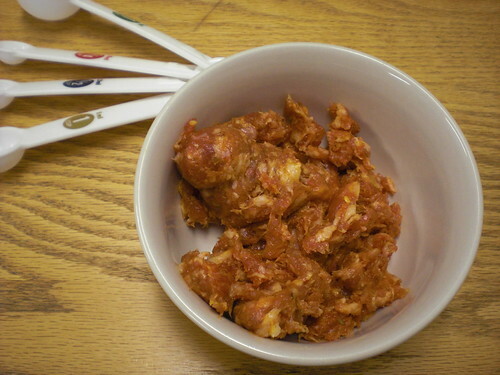 It's spicy enough to make you hate your mouth, but the mix of avocado and red bean gives for nice textural variation. You can sub any type of chicken in here btw. Actually, they might get pissed at you, but if you ask often enough, they stop caring. Cheeseburger Deluxe - Uh, this is going to sound really stupid, but for $5.42 (it used to be $4.91!!!) it's a really good deal. Their burger isn't all that incredible, but they put it together for you... unlike Hamdel, and it tastes more like real beef haha. No, but the real reason you get this is for the fries. They're fried in the same oil as their tempura shrimp, so they pick up the same flavor. Roll Broadway - Turkey, swiss cheese, onions, and... cranberry sauce. I fuggin' love cranberry sauce. You put that on any sandwich and I'll order it. This is no different. Hot Roast Beef - A combination of roast beef, meunster, and gravy... oh and some other nonsense like lettuce and tomatos. It's nothing incredible, but it has gravy in it. Anything is better when it has gravy in it right? Hm, that's up for debate, but their gravy is pretty delectable. Turkey Gobbler - It's like the hot roast beef, I like it for the gravy. It's just juicy turkey breast (which I think might be left over from the lunch time hot food trays) and gravy. I mean, of course there's other stuff, but those are the main points. Have I mentioned it's sandwiched by garlic bread? Honey Bunch - Grilled chicken in honey mustard plus swiss cheese... and spicy honey mustard for that extra bit of kick. Actually, I can't taste the spicy aspect at all. I really like honey mustard though, and this hits the spot. Most people probably wouldn't think it's anything special, and it's not, but you could do worse. Fresh Turkey Wrap - Sorry, this is cheating. It's the same thing as the Roll Broadway, just in wrap form. Uh, have I mentioned I really like cranberry sauce? Heh, yeah, I guess I don't really have 8 sandwiches I like at M2M. I guess most of the novelty in M2M for me is the fact that they sell Asian drinks and snacks. Not really in the sandwiches. That's not to say the sandwiches aren't pretty incredible on their own, just that milk tea makes everything taste better. Also, I haven't seen Yakult sold anywhere else in the UWS, and that makes me sad. On a related note, I bought coffee soda there once. Where'd that go? I thought it was pretty good. Maybe I'm the only idiot who was willing to try it. Sigh, that's unfortunate. Someone once mentioned that there should be a list of suggestions for sandwiches to get at M2M. Well, this isn't it (I'll get to that in a future post). Instead I'm going to visit Hamdel, a place that keeps my wallet much thinner than it has to be, and keeps me going to the gym. After my points and meals ran out after freshman year, Hamdel became my second home. Some people claim they go there a lot, well... I'd put money on the fact that I collected more free gold cards in my sophomore year than they have in their college career. Anyhoo, it would be incredibly stupid to try to analyze every sandwich they serve (Although I have actually tried everything on their menu, also known as the Tour de Hamdel), so I'll just make a list of my favorite 8 (don't ask... it's a lucky number) and reasons why I love them. NYPD - It was the first sandwich I ever got at Hamdel, basically roast beef, cheese, bacon, and bbq sauce. Nothing outrageous, but there's nothing to dislike. It was a favorite of mine for well over a year. The picture at the top is the NYPD in all its glory. Mojo Melt - This is basically a Fat Boy but with roast beef instead of pastrami. The combination still works. Hmm... maybe I just like their cole slaw. #3. Grilled Combo - A basic grilled chicken with mozzarella and teriyaki sauce. It's a sandwich I'll order if I feel like I need to eat 'healthier.' Ha, that's debatable. Undergrad - Combination of corned beef, swiss cheese, and sauerkraut. As for the mustard, I always replaced it with honey mustard. I'm not sure why I like this, but I do. The Judge - Reserved for when I have a free card. Always ordered deluxe. 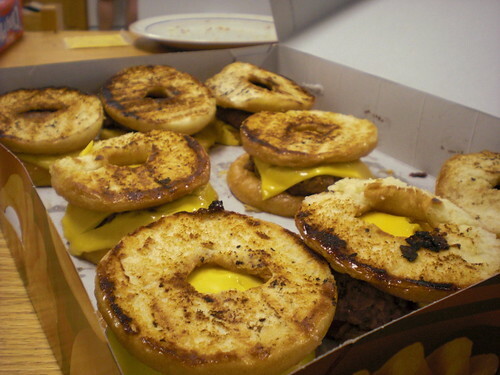 Covered in cheese, bacon, ham, and fried onions, it's a heart attack waiting to happen. I like to think I'm living dangerously when I order it. The Don - The idea of mozzarella and marinara sauce on a burger appeals to me. It's like I'm having a meatball sub, but with fries and all that jazz. E-Mail - The novelty of having guacamole and raw onions in a burger is sorta unique. 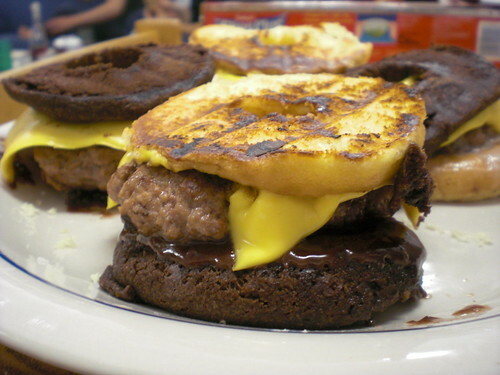 Some people probably won't like the idea of that much fat in a burger. Meh, I embrace it. To be honest, this list is purely based off my own opinion. There are a lot of sandwiches I absolutely can't stand (namely Jaws, and the tuna melt), and I feel like their paninis are rather mediocre, so by no means is this a comprehensive ranking for things you should get. I only wrote this hoping that someone might run across it when they're plum tucker out of ideas at Hamdel. Anyway, just don't flip out and leave hateful comments when you realize you order The Judge and your left arm starts to hurt. I'll do one of these for M2M too, as that was the original request haha. So now that I've finished my backlog of posts on Taiwan, I can finally get around to posting about the stuff that I actually ate during the year (not overly exciting for the most part). My suitemate and I got into a lot of baking at the beginning of the year, so I'm probably going to knock out those things first. This list... starts with a bacon pizza. What you see above is the final product. Although I must warn you that when I say bacon pizza, it's not as simple as it seems. Since we made this from scratch, we were able to take some, let's call them liberties. 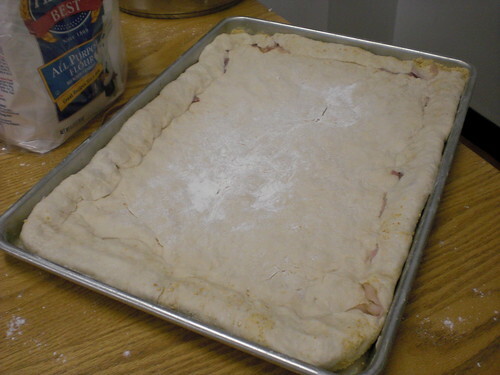 We first started by making dough from scratch. With a recipe borrowed from somewhere on the Slice website. Really simple, basically the standard mix of flour (although we had to use a lot of whole wheat when we ran low on white), sugar, salt, yeast. Mix it all together, beat the crap out of it and let it rise. 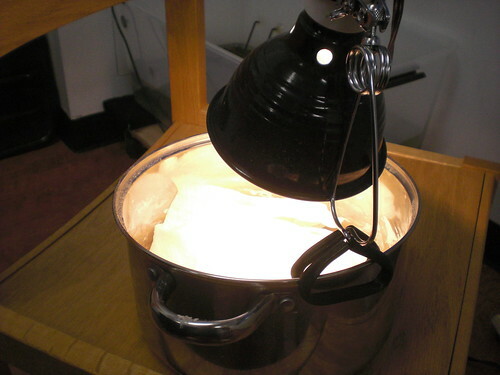 Since this was in the dead of winter (yes, a long time ago), and Columbia doesn't know how to regulate heating/cooling relative to the seasons, we borrowed the heat lamp from our turtles to make our dough rise. SORRY GUYS! While we were waiting for our dough rise, and oh did we wait, we prepped a full package of thick cut bacon. 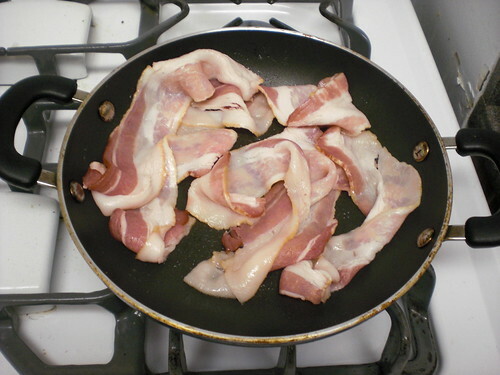 By our estimation, the baking time in the oven wouldn't suffice to cook through the bacon, and we wanted a crispy topping, not a soggy strip of bacon that wouldn't break. Let's be honest, the thought of gnawing on semi-cooked strips of pork fat isn't very appetizing. We also took some sweet Italian sausage and separated it from the casings, crumbled it, and pan fried it until it was just browned. It was a group consensus that a single type of meat on pizza was somewhat weak. I think this was actually cooked in the bacon fat, so that it would infuse the flavor. To be completely honest, I don't think it made a difference, but it sounded good in theory. 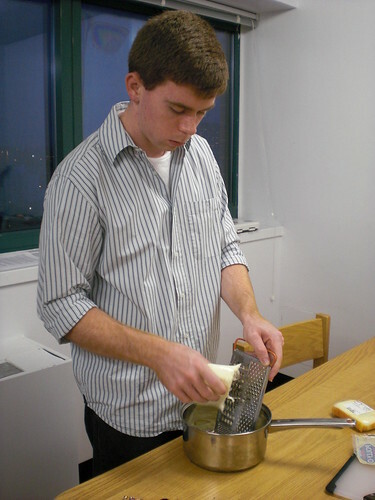 What post of pizza baking would be complete without a picture of Chris shredding cheese (obviously taken without him knowing). I will probably be murdered in a few hours for posting this. Worth it. And there is our crust, post rising, and post beating. It was recommended that the dough be separated into 3 smaller pizzas, but when we were rolling it out, it seemed to tear way too easily. In retrospect, post baking, it rose quite a bit, and even though our pan was way larger in area than a traditional circular pan, it would've been smart to split it into 2 batches. Whatever, it ended up being a super thick pizza, although it wasn't overly doughy. We would've eaten it one way or another, so it's really a moot point, but note to self... scale back dough for singular pizza. 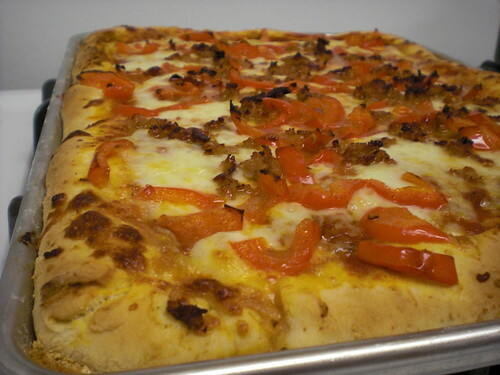 Oh, and if you have a really sharp eye, I'm sure you can notice that our crust is actually lined with bacon. That wasn't on purpose, I just did a craptacular job of tucking it in. 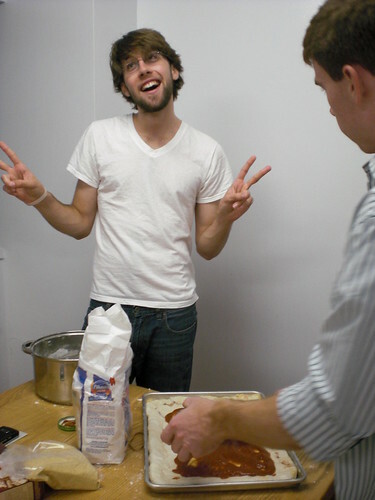 What post about baking pizza would be complete without a picture of Daven being 100% useless and continuously throwing up peace signs. If there were an award for the most Asian white person, he would win it. For real, his Chinese is probably as good as mine, and he's even better at Japanese. 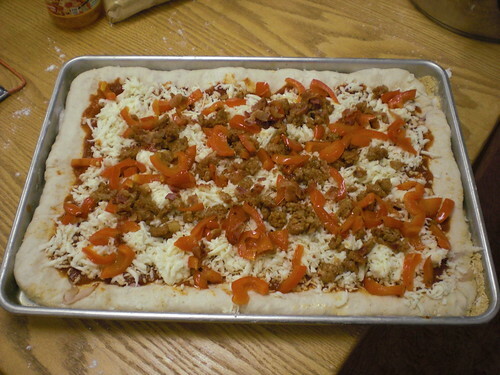 And... the pizza ready to bake. We should've used green peppers. There's all too much red on this pizza between the sauce, sausage, and peppers. Did I mention that we used an entire pack of cheese on this beauty? I think the final thing probably weighed close to 5+ pounds between the dough, cheese, sauce, and other crap that we added. Easily finished between 3 (yes it was just the 3 of us... shut up). It was delicious and I kind of want to do this again before the end of the year. 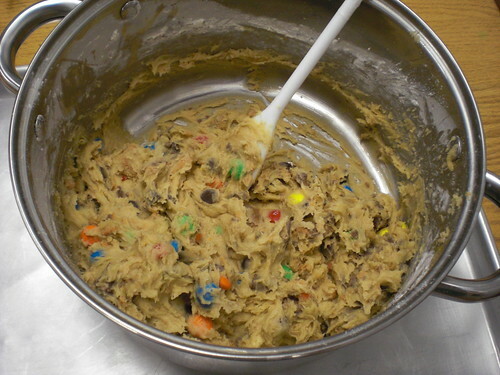 I'm also tagging this as a recipe (questionably haha). I wanted to write this post about a specific bento place that I went to, but realized how stupid the concept was. There's a billion of these places littering the streets of Taipei, so what's the point in writing about a generic no-name place that serves with the same menu as a lot of other places (I'll probably post about a bento box place in the future, so I'm going to make a disclaimer that I fully understand my hypocritical nature)? Anyway, a couple of days before leaving Taiwan, I was wandering around Taipei Main Station and was super hungry. 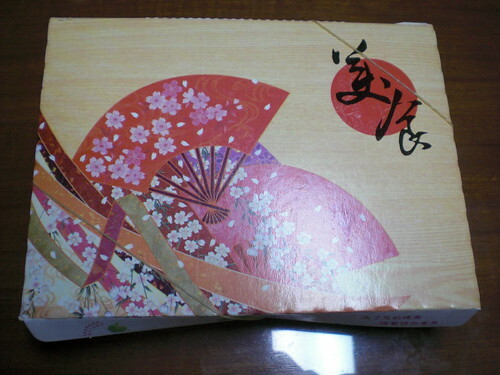 Having spent most of my money on... well, probably something stupid, I just wanted a cheap lunch that wasn't from 7-11. 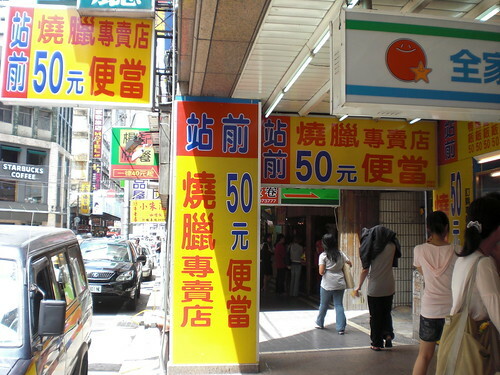 When I saw this giant yellow sign that screamed 50 NT ($1.50) for bento specializing in roast meats. 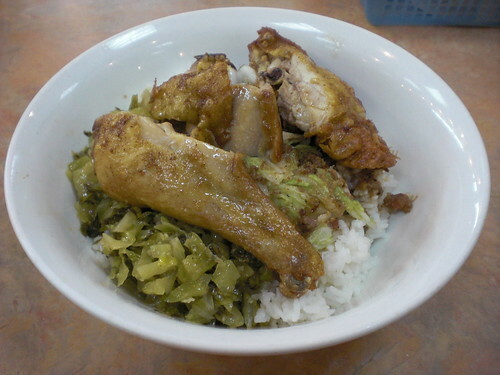 Cheap street meat... basically Taiwanese chicken and rice. I had a hankering for roast duck. 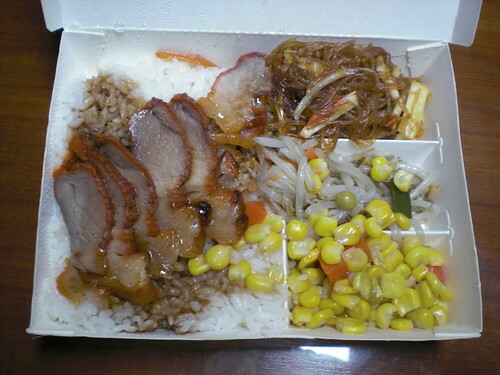 For 50 NT, you get quite a bit of food... a serving of rice covered in 魯汁 (basically soy sauce used for marinating and roasting the meats), a portion of sliced roast meat, and 3 sides (randomly picked on the day as corn, bean sprouts, and vermicelli stir fried with tofu). 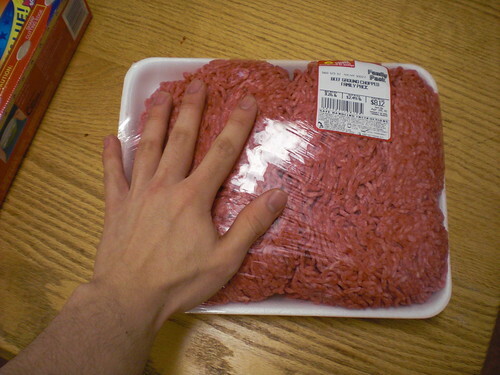 The meat was clearly glistening of fat, major plus. It was tender, and fell apart upon being prodded with chopsticks. The sauce... was good, thick enough to coat the skin, and just sweet enough to take the edge of the oily skin. The sides were... uh, I don't remember, they're side dishes. All in all, pretty average in the grand spectrum of bento places. Seeing as this is a cookie cutter example of this kind of food in Taiwan, all I have to say is that, NYC would be a better place with fewer Halal carts and more bento places. A boy can dream right? The full name of 來來港式台式現鈔飯麵 (Lai Lai Gang Shi Tai Shi Xian Chao Fan Mian) is more than a mouthful that translates to 'Come Come HK/Taiwan Style stir fry rice and noodles.' In short though, 來來 simply means 'come come,' a short phrase that elicits (in me at least) heartwarming images of my grandmother yelling at me to come back inside for dinner time. Too kyoot. Located on 118th street in Taipei's 大安 district, is an unimposing, and honestly, kind of dingy looking mom and pop shop that serves stir fried dishes. You know it's legit when the mom and dad deal with the money, the kids take your order, and the grandfather cooks the food! Anyhoo, the inside looks beat up, with wobbly chairs, wobbly tables, and poor lighting. For all its inadequacies, the restaurant is packed with people who appear to be regulars, as they're all ordering without menus. It's both a massive turn off and at the same time eerily charming. 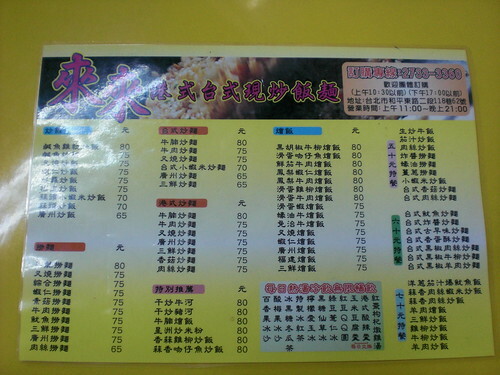 As far as the food goes, everything's under 80 NT ($2.50) so everything's a good value. I chose the 干炒牛河 (gan chao niu he) which is basically flattened rice noodles stir fried with beef, onions, bean sprouts, and cabbage (on a side note, I always thought the first character was '乾,' but I guess not...). 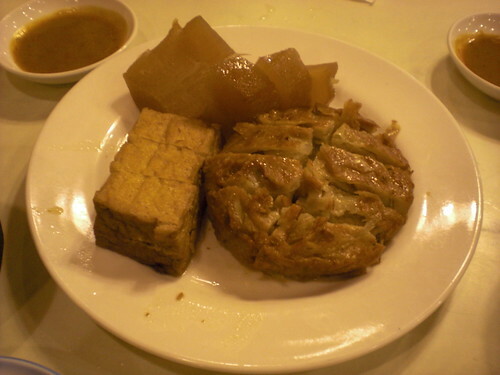 It's one of those comfort dishes I remember from my childhood that I'd get at dim sum because I wouldn't eat seafood. Their rendition was okay. 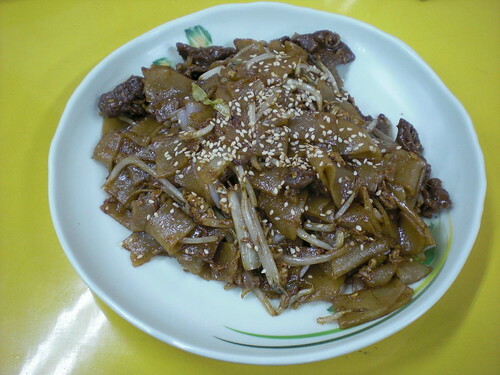 The beef was well tenderized and marinated, the noodles were chewy and resilient. The vegetables... well, they were all there haha. The only thing I would gripe about (very minor complaint) was that the sauce was too heavy on the sesame oil. That's a debatable point, as I'm sure some would like it, but I was a bit annoyed. Basically, it's nothing I'd recommend, but I would go back if I were in the area. It's in a bit of a weird gray area in terms of how good it actually is, I think I just like the novelty of the idea. Oh, and the prices. 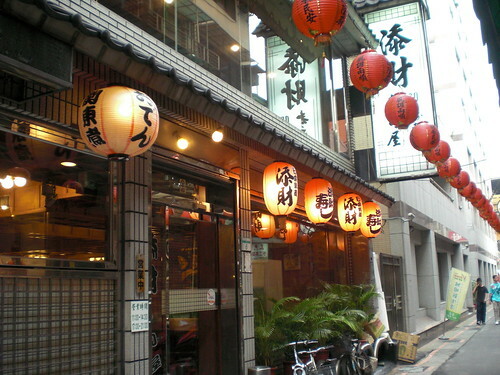 Nestled in an alleyway near the Taipei Main Station is a street called 武昌街 (Wu Chang Street). Rather unimposing, and actually dingy looking, there's not much located here outside of a few tailor shops and custom shoe places. I would never think to set foot down this street to be completely honest. 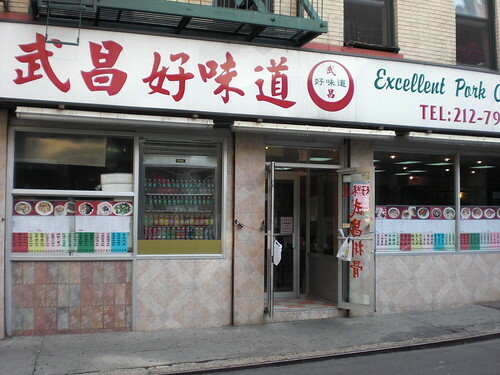 There is however, a single restaurant here that makes me come back every few weeks, called 添財 (Tian Cai). Hehe, part of me just likes it for the name since it's a homonym for genius or '天才,' but part of me likes it for the traditional feel, the authenticity (the people who work here are actually Japanese! ), and because it's a place I went to a lot as a kid. Whatever the reason, it's my favorite Japanese places in all of Taiwan. Oh, and sorry for the pictures, they got pissed when they saw my camera so I took all of these really quickly. 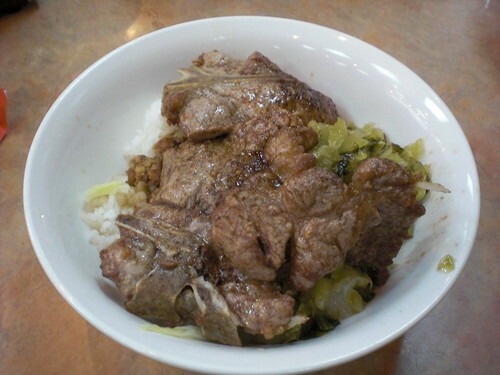 On this trip I chose to get the gyu-don or 'beef bowl.' This thing cost, I think... 110 NT ($3.50), so the prices aren't terrific. In fact, they border on the high end if you consider what a similar thing could cost in a less formal restaurant setting. 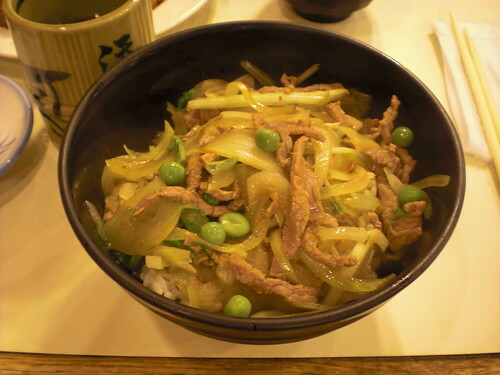 In any case, it's as simple as it looks, thin beef strips marinated in teriyaki sauce is stir fried with onions cooked to transparency, peas, and scallions that are sliced into thin flattened strips. All of this is served over medium grain rice that is soaked further in teriyaki sauce sweetened with a slight bit of sugar and rice vinegar. The combined flavors of tart sweetness accented by the sweet flavor of the beef is a winning combination. No overpowering flavors, just a bunch of tastes that meld together perfectly. Simple yet effective. My grandmother got fried fish of some sort. I tried it. I'm not in love with fish, but it was lightly battered and somewhat soggy by the time I got to it. The fried asparagus was good though, and I for sure jacked her fried sweet potato too (I love those things with a passion). I think the price might've been slightly higher since it was seafood, but I have a really bad memory. From the parts I had, it was solid. I just don't really like fish is all. 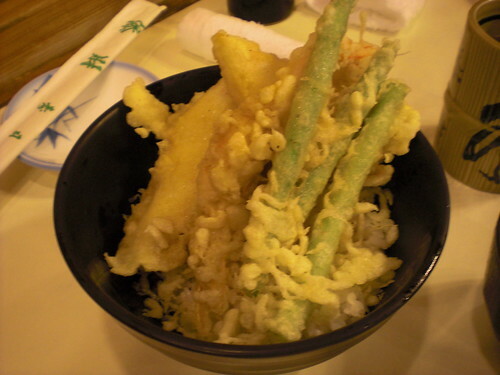 Final thing we ordered as 天婦羅 (tian fu luo) or Japanese style tempura. Similar in selection to the street variety I guess, you go an pick your own dish from a pot of daikon and pork broth. We got fried tofu, some daikon radishes cooked in miso, and a giant tempura disc. All of them were good, and I think the combined price of this dish was actually under 100 NT ($3). Interesting to note, the daikon radish actually managed to infuse the flavor of the miso entirely. Bonus, sweet sweet brown sauce on the side. This is hands down my favorite Japanese restaurant in Taiwan. Disclaimer... it's not because it tastes incredible, or because the prices are so outrageous, I just happen to have a sentimental connection to this restaurant. When I was still a toddler, this was the only place I'd be willing to go to with my family, since it didn't reek of fresh fish. As such, my grandfather would take me here all the time, with my order being the same everytime... the katsu-don. So if you're gonna go here expecting the world, don't. That's not saying it's not amazing, I just happen to give it bonus points because of my childhood is all. First off, I'd like to say... I'm switching my photos to a larger size. Mostly because I got some complaints about the thumbnail size ones that I've been posting (but really, if you clicked on them they'd blow up to full size). Oh well, everyone wins this way I guess. Anyway, back to the food. I go to 西門町 (Xi Men Ding) all the time. Mostly when I'm bored, and mostly for the food (let's be honest, with my default dress being a rowing shirt and jeans, I'm not there for the latest fashions). The selection there is pretty decent, a mix of street vendors, Japanese, Korean, and fast food litter the small grid that comprises maybe 5 city blocks. There was always 1 place that I really wanted to visit, but never did in the past because of my aversion to seafood. 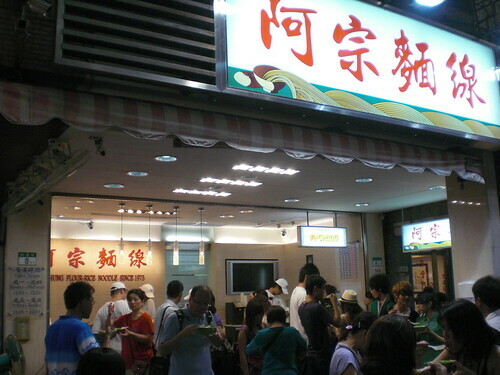 That place is 阿宗麵線 (Ah Zong Noodles). It might sound stupid that I'd want to visit a place that specializes in oyster noodles, but this was for good reason. They're really famous, and there's always a super long line. This past Summer, I finally got my chance to have a bowl. For all of 50 NT (which is $1.50 if I remembered the price correctly), you get a large serving of oyster soup with thin noodles, known as 蚵仔麵線. The thick oyster soup is made with a base that tastes strongly of miso, combined with pork broth, garlic, oysters, and then thickened by corn starch. 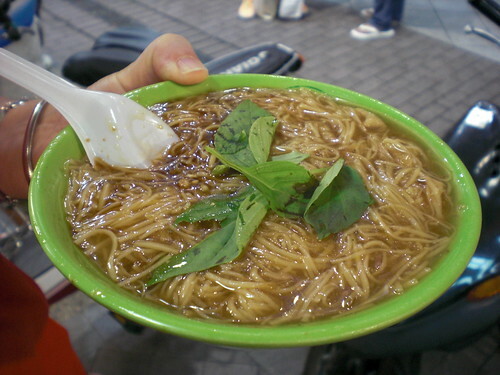 Use of thin rice noodles is preferred for both the character of the strands as well as the increased surface area for coating. End result is a bowl of noodles unmatched in flavor when compared with traditional noodle soups, and what I'm sure is incredibly satisfying in cold weather (not that I'd ever know in Taipei's Summer season). Definitely worth checking out even if you're not close, but be prepared to stand while eating. There are no tables, and nowhere to sit either. That hasn't stopped a ridiculous number of customers from visiting everyday, and should be considered a testament to how good it really is.